This month I had the privilege of being assigned to Annie’s Noms for my Secret Recipe Club assignment. Just clicking through to the site is a sugar high. Annie’s site is full of delectable baked goods of all sorts. My own personal fantasy world. Except for the fact that I recently went gluten-free…and was about to embark on my first Whole30. So in this case, my own personal hell. The world of Annie’s Noms brought together, all in one place, the reality of what I couldn’t have. Needless to say, it was a bit challenging to find a recipe to cook. the This of course, is nothing against Annie and I will ABSOLUTELY be back once I can eat more glutenous foods again. Those Chocolate Chunk S’more Brownies especially. I know I can find a way to make them gluten-free. But just days before my Whole30 was about to start, I wasn’t ready to experiment with ratios and flours. Even worse, I didn’t want to have these delicious treats hanging around the house, forcing me to share them with friends and coworkers. If I was going to take the effort, they would be mine. I was so excited when I came across Annie’s Cinnamon Raisin Overnight Oats. Now this was something sweet that I could enjoy without guilt or having to make a whole batch of something just for a single bite. Overnight oats had me intrigued for sometime now. I tried making them a different way with steel cut oats with little success. This recipe seemed super easy. One part liquid to one part milk. I skipped the addition of yogurt and dried fruit and opted to keep things simple. Banana and cocoa. While not the quickest breakfast ever (it did require a bit of thought the night before), the effort was completely worth it. Using an immersion blender guaranteed no chunks of banana and instead a custard like breakfast the next morning. It was one of my last grain breakfasts before my Whole30 started and every morning I dream of when I can enjoy it again. In a small bowl, mash banana. Add almond milk and cocoa powder and blend with an immersion blender until well incorporated and slightly frothy. 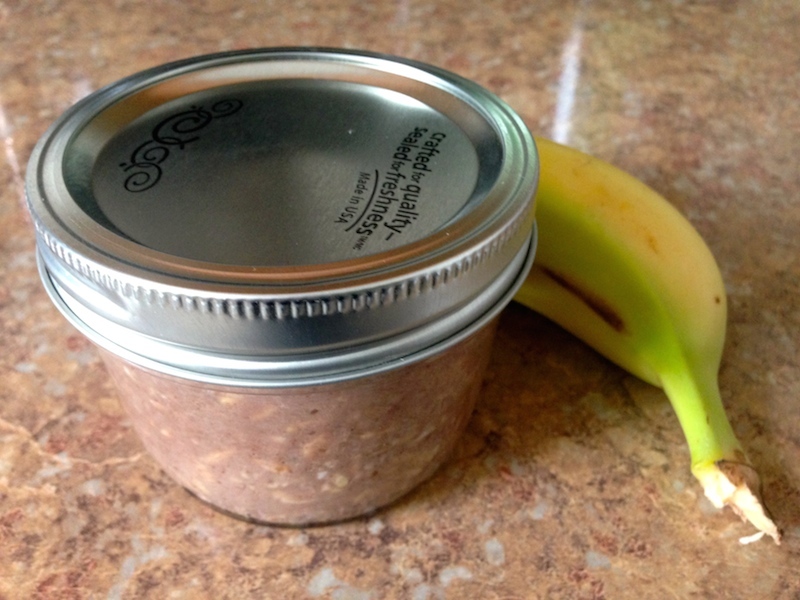 Stir in oats.Divide mixture between two half-pint jars or small bowls, cover and refrigerate overnight. The next morning, give your oats a quick stir. If you’re looking for some extra banana flavor, feel free to slice half a banana over each jar. Enjoy! YUM! I just make a chocolate peanut butter banana pudding the other night so love the idea of having those flavors as a breakfast. These oats look fabulous! Chocolate and Banana for breakfast seem like a great plan to me. Thanks! So simple and so awarding in the morning! 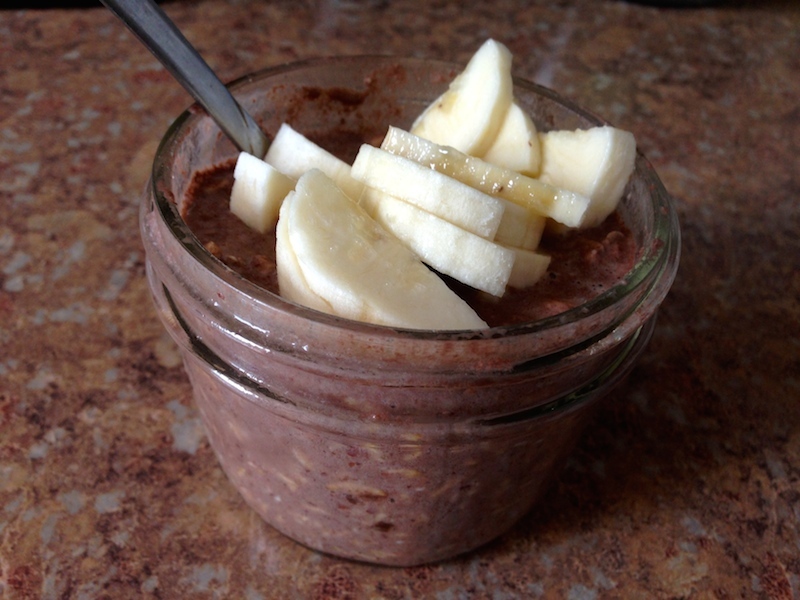 I love overnight oats and this is one of my favorite flavor combinations! Agreed. I’ve tried experimenting with a few others. I love the banana addition. It just keeps me fuller all morning. This is a great choice and how fun to discover something new for breakfast!! Can’t wait to try this! Thanks Jane. It’s become my favorite breakfast and so many variations! Yum, flavored oatmeal’s were one of my favorite breakfasts before I went grain-free. It looks delicious. Thanks April and it’s exactly what I’m craving on my whole30!